With seventy years of residence in Austin County to his credit, the prosperity, influence and accumulated esteem of Hermann Sens have been in proportion to the length of his residence. His life and work serve to illustrate the various phases in the development of this section of Texas from early times to the present. Mrs. Anna Buechmann, a widow, living near her family in Colorado County. Hermann Sens has little remembrance of his native country or of any incident in his life prior to his arrival in Texas. The pioneer schools of Cat Spring gave him little more than a bare proficiency in reading and writing, and he lived in the home of his parents until his marriage, when he bought his father's old farm, but later purchased two sections of wild prairie in the Milheim League, onto which he moved the buildings constituting his former home, and he still occapies the old family residence. With the outbreak of the war he enlisted in Captain Daniel's company, Colonel Elmore's regiment, and remained with his command about a year, his principal service being in and around Galveston. After his discharge he was engaged in hauling ammunition and other supplies out to the Rio Grande, these supplies being destined for the army of Maximilian, as he is now firmly convinced. After three trips across the country to the Rio Grande he tired of the service and determined to leave the country and go to St. Louis, Missouri. He and several other comrades avoided the detachment of Federal soldiers located at Brazos Santiago, Mexico, went by boat to New Orleans and thence up the river to St. Louis. Arriving there in March, 1865, he found employment on garden farms until the summer. He then rejoined his parents in Texas and applied himself vigorously to repairing and managing the homestead. The present home of Mr. Sens is in the vicinity of Sealy, and he has lived there since 1881. His first farm was on the prairie and for many years he has been engaged both in farming and stock raising. About sixty acres of his land is now under intensive cultivation. Besides his holdings in that vicinity he bought 722 acres additional, and that together with other lands he has divided among his children who have families. It took more than twelve miles of fence to enclose his possessions and these and other improvements are practically the result of his own management and close supervision. For many years his cow brand "7-H-S" has been familiar in the local stock market, and he has frequently been a shipper to the Galveston and Houston stock yards. Mr. Sens has desired no particular participation in political affairs beyond an interest in good local government and improvement, and for many years has·cast his ballot for republican candidates. The only society of which he is a member is the Sons of Hermann. In 1860 Mr. Sens married Miss Theresa Loeschika. Their oldest child is Lena, widow of Fritz Bielefeld, and she has one son. Emma is the widow of Fritz Hillbold, also lives in Austin County and is the mother of four children. 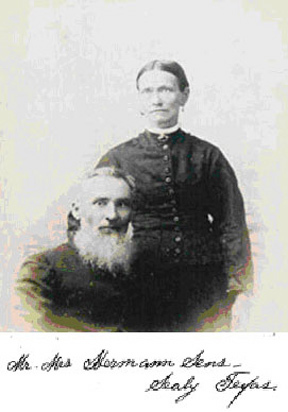 Anna is the wife of Ernest Bubak of Colorado County and has four children. Fritz is a stockman of Austin County and by his marriage to Mary Kveton has four sons. . Hermann and Theresa are twins, the former a stock man living near his father and has two children by his marriage to Frances Gluck, while Theresa is the wife of Albert Kveton and has six children. Mr. Sens has excellent he1pers in the management of his home farm in hls two twin daughters, Misses Eliese and Emilie.